What if My Pipes Burst This Winter? 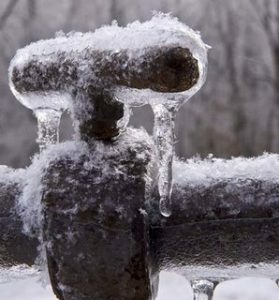 With one of the coldest winters in recent memory upon us, the threat of pipes freezing and bursting is real. Pipes that freeze and then defrost have an increased chance of bursting, causing water leaks that can lead to floods that damage the structure of your home as well as your valuables. One way to avoid this hassle is to educate yourself so you are ready in the event of a plumbing emergency. While it may seem counter intuitive, it is not usually the ice forming in the pipe that causes it to break. Rather, the expansion inside the pipe caused by the frozen water increases water pressure between the ice blockage and the closed faucet. Due to this pressure buildup, pipes most often burst in areas that have not yet frozen, which results in an immediate leak of icy water. It’s not too late to take measures to prevent your pipes from freezing and bursting. Your best bet is to insulate the pipe and keep the surrounding area warm using building insulation. You can learn all about How to Insulate Your Pipes in our blog post of the same name. If you suspect you have a frozen pipe, don’t panic, but do take action. Call a trusted plumber immediately to report the issue. Do not attempt to thaw a frozen pipe with an open flame. This process can be dangerous and inefficient. Instead, you may be able to thaw the pipe with a hand-held hair dryer. Simply open the faucet and apply heat to the pipe slowly, beginning close to the faucet end and moving toward the frozen area. Throughout this process, be sure you are not standing in water. Doing so while working with electrical items can cause electrocution. Turn off the water main shut-off valve, which is usually located at the water meter or where the main line enters your home. Leave the faucets open until your plumber has had a chance to repair the damage. If you have your own private well, be sure to use the shut off located near or on the well holding tank. Note: If you’re unsure where your shut off valves are and your pipes have not burst, do yourself a huge favor and find them now to save time in an emergency. If your home or basement has flooded, consider whether you have any live electrical cords or outlets submerged before stepping into the standing water. If in doubt, wait for your plumber or call your local Public Works Department for assistance. Burst pipes can cause a great deal of stress. Because they increase in likelihood during freeze-and-thaw cycles, now is the time to locate your shut off valves and take note of Simpson Plumbing’s contact number so you’ll be ready for the worst, while hoping for the best.